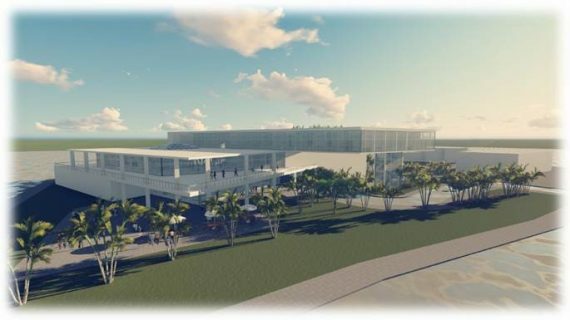 Artist’s rendering of CasaCuba at FIU. A group of Cuban-American community leaders has stepped forward to support “CasaCuba,” an initiative that brings together all things Cuban at FIU. The initiative will harness FIU’s prestigious scholarly and cultural resources to activate its extensive Cuban collections for scholars and the public, with the eventual goal of constructing a 50,000-square-foot facility on FIU’s campus. The academic pillar of CasaCuba will be the Cuban Research Institute (CRI), in the Steven J. Green School of International & Public Affairs, the nation’s premier center for academic research and public programs on Cuban and Cuban-American issues. CRI offers a certificate in Cuban and Cuban-American Studies and more than 70 courses focused on the island and its diaspora. FIU also has significant resources related to Cuban art, history and music, including the Darlene M. and Jorge M. Pérez Art Collection at FIU, which documents the historical trajectory of Cuban art since the late 1800s, and the most extensive publicly available collection of Cuban music, the Diaz Ayala Cuban and Latin American Popular Music Collection with more than 100,000 items. In addition to CRI and the Diaz Ayala music collection, CasaCuba will house oral history recordings, searchable genealogy records, exhibitions, meeting spaces, classrooms and other Cuban collections. The idea for CasaCuba began at an FIU Foundation board meeting last year, during which board members discussed the extent of FIU’s Cuba-related resources. Things evolved and a small group formed an advisory board and recruited others, eager to advance the initiative that grew into CasaCuba. CasaCuba advisory board members represent business; fashion; entertainment and the arts; communications; and legal and public affairs. The full board met for the first time on March 24, 2016 and elected a chair and vice chair. Alberto L. Ibargüen, president, chief executive officer and a trustee of the John S. and James L.
Eduardo M. Sardiña, former president and chief executive officer of Bacardi U.S.A. In May, the CasaCuba initiative received initial seed funding from the Knight Foundation to hire an executive director for the center. Among other early priorities, the executive director will refine, develop and implement the strategy of the center. In addition, the executive director will work directly with other community organizations focused on Cuba. Established in 1950, the Knight Foundation, which has the goal of fostering “informed and engaged communities,” has previously supported several FIU projects. They include FIU Miami Urban Future Initiative, a joint project of FIU’s College of Communication, Architecture + The Arts and the Creative Class Group at Mana Wynwood, as well as a grant to The Wolfsonian–FIU to support programs that provide greater public access to the museum’s collection of art and design. “Thanks to the Knight Foundation, CasaCuba can move ahead with its mission to educate and engage the Cuban community,” Arellano said. For more information on CasaCuba, please email casacuba@fiu.edu. Just on time! My best wishes to Casa Cuba!!! Nothing better than history and education. I would like to help as a volunteer in anything if is possible. Great ideaaa !!!!! Finally ! !